Speaking Topic/Expertise: Personal Branding Expert, Certified Image Master, Lifestyle Coach, Master Trainer from ByFerial, Certified Civility Trainer and Certified Courtesy Coach status with the International Civility Trainers’ Consortium. Geeva Samynathan is a strong believer that a positive self-image raises your confidence level dramatically and that a person with good grooming and poise automatically stands out in the crowd. As a highly qualified lawyer, entrepreneur experienced executive level manager, and business owner of ECTAA, Geeva has had plenty of opportunities to put her beliefs to the test. Through years of both professional and personal experience, Geeva has learnt that civility and etiquette are the secrets to thriving in the modern world. Geeva is able to share her experience and expertise with others and is dedicated in promoting civility in image transformation and behavioral transformation. 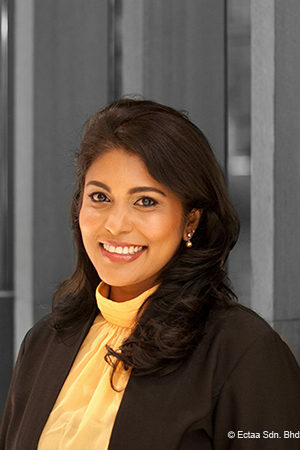 Geeva is a certified Personal Branding Expert, a Certified Image Master, and a Lifestyle Coach and is the 1st Master Trainer from ByFerial, Australia, a Certified Civility Trainer and Certified Courtesy Coach status with the International Civility Trainers’ Consortium, Canada and a member of the Civility Experts Malaysia consulting team. Her niche expertise and entrepreneurial savvy have put her on the path to becoming a household name in Southeast Asia. Geeva has won several awards both in Malaysia and international with media presence. Geeva believes that “there is a need to be socially responsible and give back to the society”. She takes great pride in her work with several women’s organizations including being an executive with the National Association Women Entrepreneur Malaysia (NAWEM) which allows her to actively immerse herself in social work and welfare. In addition, Geeva serves as a brand ambassador with World Organics, New Zealand which allows her to live and promote an Organic lifestyle; from the food she eats, to her own beauty regiment, Geeva knows firsthand the benefits of a socially responsible lifestyle.